It’s always fascinating to me how people can go from a situation of brutal oppression to becoming the oppressors. Some free blacks owned slaves and profited from the slave trade. Dr. Henry Morgantaler, a survivor of the Holocaust, became the leading abortionist in Canada. Mainstream media is impressed that she’s the second doctor to take the blood-stained reins at Planned Parenthood. America’s most misreported abortion chain hasn’t been led by a medical professional for 44 years. I would’ve thought that would be a criticism, considering the organization touts itself as the leader in “women’s healthcare,”, and, well, everything else. For instance, during Dr. Wen’s role as the self-described “Doctor for the City” of Baltimore (starting in 2015), how could she possibly explain why her department partnered with Planned Parenthood of Maryland (PPM) in an initiative for healthier mothers and babies called B’more for Healthy Babies? Planned Parenthood of Maryland provides no prenatal or pediatric care. Why in the world would they be a partner in an alleged medical initiative to keep babies alive? All PPM and most Planned Parenthood centers around the country do is kill babies. There’s not a single mention of ‘mother’, ‘mom’, ‘parent’ or baby in PPM’s latest (2016)annual report. Of course, following pro-abortion “logic”, not a single pregnancy center was listed as a partner in the B’more for Healthy Babies program. It makes as much sense to partner with Planned Parenthood in a health initiative to reduce infant mortality as it does to partner with Big Tobacco to reduce smoking-related deaths. 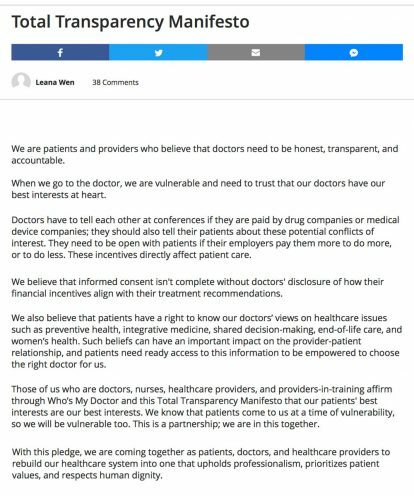 I wonder if Dr. Wen, who created this “Total Transparency Manifesto,” will employ this at the abortion giant when it comes to the truth about abortion’s physiological and emotional impact on women. They self-impose a gag rule every day. So much #fakehealth, so little time. In Dr. Wen’s much-celebrated introduction video, she touted being an immigrant. So are millions of others, including one of my sisters, in this beautifully diverse tapestry that is America. Interestingly, though, her sister—Angela Penelope Wen—was born here and would never have existed under China’s One Child Policy where gendercide is epidemic. Dr. Wen went on to claim that her family relied on Medicaid. Interestingly, she never mentions this on her now-removed (but archived) personal blog, www.DrLeanaWen.com. Yes. It is a great thing to be alive and to have the opportunity to pursue a future. Being pro-abortion takes conditioning. You have to skillfully avoid the truth and make up your own “truth.” And don’t worry…mainstream media won’t fact-check you. So, whatever narrative you want to share, you’re free to lie, no matter what. How I wish she felt the same for others’ babies and that we’re all stronger than our circumstances. New life does give us joy, wonder and meaning. My wife and I can’t imagine life without our four amazing children. How anyone can preside over an organization that rips beautiful possibilities apart, limb from limb, is just unfathomable to me. Editor’s note. This appeared at the Radiance Foundation and is reposted with permission.